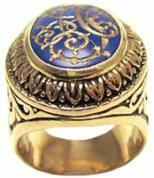 Under the supervision of his father Vartan, Vladimir started creating jewellery in 1966. He does original engravings for coat of arms, decoration and heraldic emblems. All his work is highest quality and workmanship. With expertise, Vladimir works with all techniques of decoration whether it is metals, wood or bone. He uses filigree, granulation, hammering, inlaying, niello, enamel, encrusting, engraving and sculpting on all metal, wood or bone textures. He has participated in around thirty different exhibits across Russia for his talents as jeweller and artistic metal works. He also gave training and perfection courses at Montreal's school of Metal Artistic fine Arts. Creator of fine jewellery, rings, bracelets, pendants for many jewelleries across Quebec, New Brunswick, Ontario, Massachusetts and California. 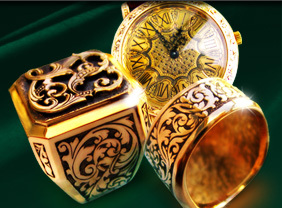 Vladimir works with antique dealers in restoring objects of great value for collectors of firearms, hunting rifles, guns and knifes engraved in many different styles. Without intermediaries, he makes everything from beginning to end. 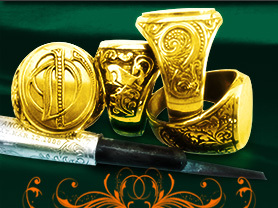 With Vladimir, you can order jewellery and other specialties for all tastes: wedding bands or rings with personal engraving on the interior, signet rings with decoration and medieval monograms, your family's coat of arms on a cigar box, a pendant or a key chain with you initials, restoring antiques, engraving your rifle or hunting knife. We ship all our products to anywhere in US and Canada. For information and special requests please call 1-877-787-8914 or 1-778-554-8787.